Hi friends. Just to let you know a little about our blog posts, our process is very scientific. Not. When we don’t have timely news about the Harvey House, events, etc., we’ll do some Googling about Slaton’s history, Harvey Houses and the like and share something we think you’ll find interesting. Now that you know the process, we encourage you to contribute when you have the hankering. Today we share another chapter from James Villenueva’s writings as posted in Texas Escapes, about a tragedy and subsequent revenge murder that only made everything worse. A compelling read and part of Slaton’s storied history. 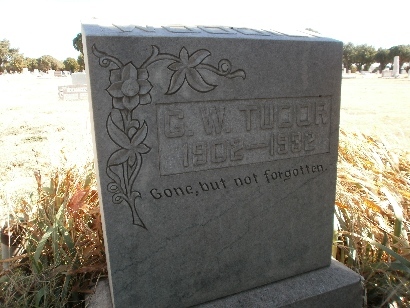 On a late August afternoon, at the Englewood Cemetery in Slaton of 1932, Woody Tudor was laid to rest. Family and friends gathered in the small cemetery and remembered a young man, 30-years-old, who adored his mom, his wife, his children but, most of all, his father – R.L. Tudor. R.L. watched as his son was buried beneath a copper colored stone with the name, Woody, etched on it. Surrounding the grave were the few remaining wild flowers of the prairie during the dust bowl; they bloomed across fields and grew unruly everyday like the untamed anger that raged within R.L.’s psyche after the accidental death of his son. On most days, over commonplace chatter and sundry pleasantries, Woody Tudor visited with his father. On August 25, 1932, Woody, his wife, and their children were driving to R.L.’s house before the entire family were to spend an afternoon at the Johnson Ranch, as they had done many times before. “R.L. and his son were great old pals,” J.W. Nesbitt, a close friend of both R.L. and Dr. Adams said during the trial. He said he saw Woody Tudor the day of his death and declared the boy appeared to be in good health in a 1932 issue of the Lubbock Avalanche-Journal. Thirty minutes after Woody was supposed to be at R.L.’s house, R.L. learned that Woody and his family had been involved in a car accident and were at Dr. Loveless’ office. R.L. arrived at the doctor’s office to find Dr. Loveless, “whittling on a stick,” as is stated in the issue of the Lubbock Avalanche-Journal. Woody sat in a chair with a broken arm. “Dad, I’m shore glad I didn’t hurt the baby,” Woody said. “Why have you been waiting here for so long?” R.L. asked his son. “We’re waiting on Dr. Adams,” Woody answered. When Woody was taken to Dr. Adams’ office, it was stated by R.L. that Woody told the doctor he could not take ether. “Dr. Miller over at Clovis told me my heart would never stand it and never to take it,” Woody said. “Yes, you can stand it,” Dr. Adams told Woody. “Doctor, if that boy can’t stand ether. Don’t give it to him,” R.L. said. “I can stand it without the ether,” Woody said. “We’ll have to give it, let’s get going and get it over with,” Dr. Adamssaid to Dr. Loveless who assisted Adams in treating Woody. “And that’s the last words he [Woody] said,” R.L. testified in court. R.L. testified that Dr. Adams and Dr. Loveless gave Woody two cans and part of a third of the anesthetic before he lost consciousness. “I went around to his face and said, ‘My God son, come out of it, come out of it,” R.L. said with an occasional tear falling down his cheeks. It would be later, on October 13th, when R.L. would confront Dr. Adams at his office. “I wanted to try to get him to help take care of those babies [Woody’s two young children],” R.L. testified. “I felt he was responsible for his death through negligence,” he said. “I’m not going to do anything,” Dr. Adams sternly said to R.L. “Get out and stay out,” he said. 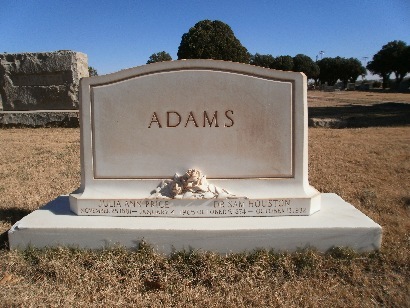 When the community arrived to bury Dr. Adams, in mid-October of 1932, almost the entire town showed up to pay their respects and mourn the pioneer doctor who was buried beneath a granite tombstone with the name, Adams, etched into the classic white stone that stood illuminated against the sun. In a four day trial, the jury found R.L. guilty of murder. The judge only sentenced him to two years because of the circumstances surrounding the crime. R.L. Tudor is buried next to his son in Englewood Cemetery.